Bethlehem – On November 19th and 20th, 2018 the Environmental Education Center (EEC) held their ninth annual Palestinian Environmental Awareness and Education Conference under the title “Promoting Environmental Action in Palestine: Mechanisms, Plans and Decisions” under the patronage of Rt. Rev. Bishop Sani Ibrahim Azar of The Evangelical Lutheran Church of Jordan and the Holy Land. 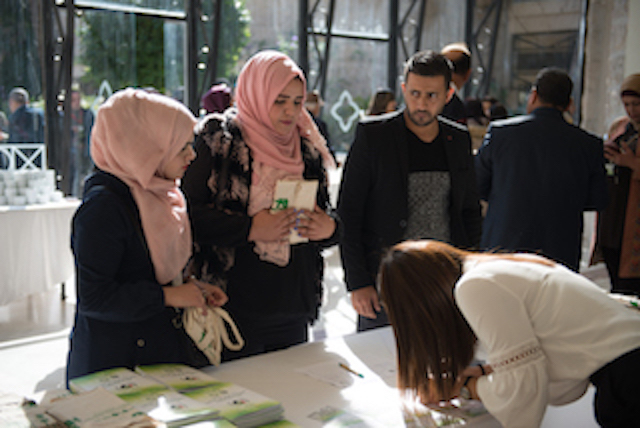 The conference brought together people from academic, GO, NGO and private sectors to contribute to the conversation about the environment in Palestine. The conference was held at Jacir Palace in Bethlehem and was comprised of 27 different speakers on a variety of environmental topics. The conference provided a space for different interest groups to discuss, contemplate and learn more and over the course of two days, the conference was broken up into 5 speaking sessions, followed by questions and ended with group plan formulation of a joint plan for 2019. The conference opened with an opening ceremony attended by Rt. Rev. Bishop Sani Ibrahim Azar, His Excellency Mr. Kamal Hamid, Governor of Bethlehem, Mr. Jamil Al Matour representing His Excellency the Prime Minister Dr. Rami Al Hamadallah, Dr. Mohammad Al Rimawi representing His Excellency Dr. Sabri Saidam, Minister of Education and EEC Director Mr. Simon Awad. The conference addressed topics varying from water treatment and waste management to ecotourism and social engagement. Each speaker brought a new perspective through a variety of scientific research methods, experimentation, research and practice. The conference explored strategies that target a variety of groups including women, students, people working in the private sector and families living in both rural and urban landscapes. Strategies were evaluated on scientific, economic, legal, social and technical strategies. To wrap up the conference, participants broke into four groups to discuss enforceable plans and actions that support great environmental change. The wide expanse of information that the conference provided allowed teams to delve deeply into ideas about plans and sustainable hope for the future.